your doors to repel and spiritually "singe" your foes. 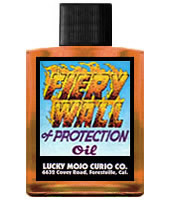 their FREE Fiery Wall of Protection Oil. We have a winner! In fact, we have 8 lucky winners! Our Facebook Fridays! winners for June 1,2018 are: Emily Wagner, Phylicia N Stubblefield, Bonnie Henderson-Winnie, Ignacio J Ceja, Joshua Robert Needler, Beverly Welch, Margie Blackwell, and Christine Wilson.